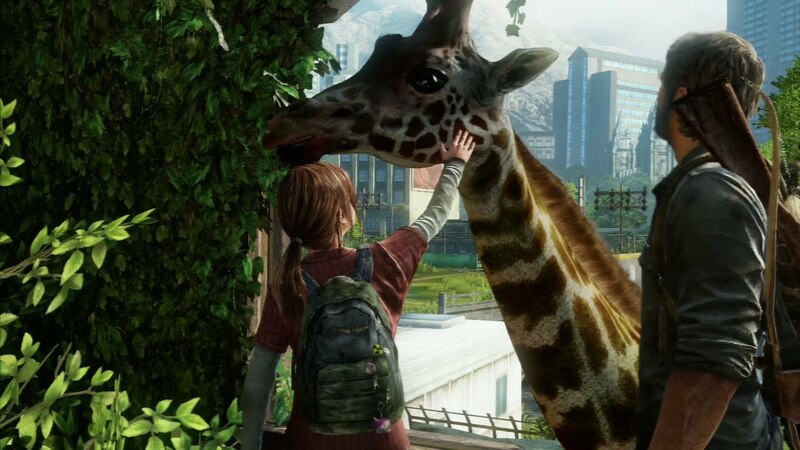 Meeting the giraffe in The Last of Us is for many players the emotional peak in an already emotional journey. Concept Artist John Sweeney tells us how the iconic scene came about. “When Ellie kills David she reaches her lowest point or darkest moment in the game. The next time we see her she’s not being her usual self. Ellie is clearly suffering from post-traumatic stress and she knows that they are almost at their destination. She also feels that she might not come out of that hospital alive. She’s quiet and withdrawn. There is this moment in the story that was designed to reignite her lust for life so to speak. By seeing something she has never experienced before, her curiosity is triggered and she momentarily forgets the struggle and death that surrounds her. This moment was captured in an early concept by artist Maciej Kuciara, but back then it was a zebra and not a giraffe. When I came on the team Maciej had left and they wanted to change it to a giraffe, because it’s such a gentle, elegant creature and the most remarkable thing Ellie could possibly encounter. The setting had been nailed down to be Utah, Salt Lake City and the gameplay was already in production. So this piece came after the block mesh was created and I worked with one of the designers to create art for that moment to match the camera and lighting. It was an earlier block mesh because the room where you first encounter the giraffe changed a little bit later. They took the art piece and added a bit of foliage to the room. They also changed the angle of the lighting to face the other direction. But other than that, the overall feel of the moment was pretty much captured here. The story ideal was nailed down so all they needed was a visual reference of how this was going to feel in game with the giraffe replacing the zebra. John Sweeney is concept artist for Naughty Dog where he works on Uncharted 4: A Thief’s End. He’s best known for his incredible art for The Last of Us which won him a spot in Into the Pixel 2014.